Allergies seem so much more prevalent these days among kids, and if you have school age children, you know, awareness and the way allergies (especially food allergies) are handled at school…is different from when we were in school. Okay, now I’m dating myself, but just this morning at Costco, I bumped into a Mom friend who asked me what other snacks can we send to school, since there are no nuts allowed. All this to say, even if you’re child doesn’t have allergies, it’s important to understand how serious it is for those that do. 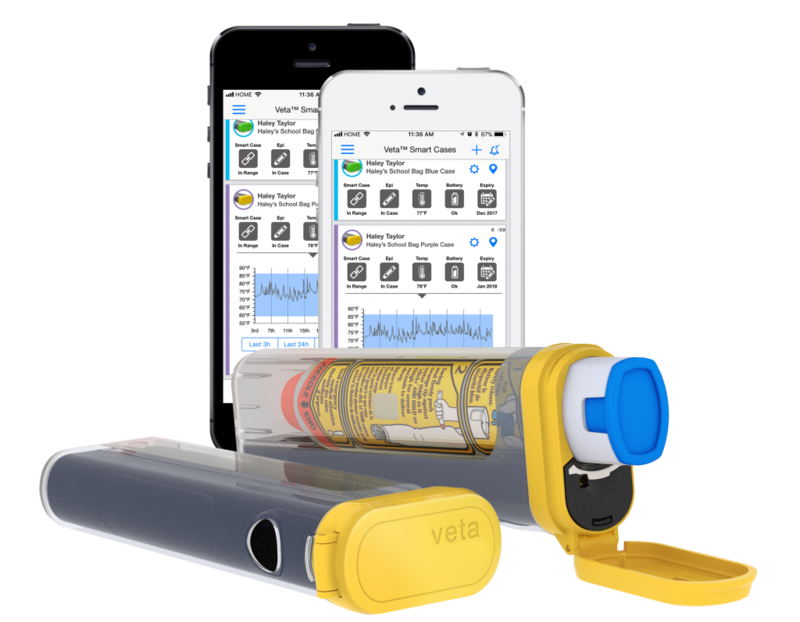 Enter Veta, the world’s first high tech smart case for EpiPen. Veta helps families living with anaphylaxis by connecting loved ones or caregivers to those with life-threatening allergies, while providing emergency and location alerts. And because it keeps everyone connected, parents and caregivers can feel a little more secure, free and confident when it comes to those allergies. The Veta Smart Case is a reusable and transparent carrier that incorporates electronics and sensors that integrate with a cloud-enabled mobile app infrastructure to ensure peace of mind for auto-injector users, their families, and their extended support network. It replaces the stock epinephrine auto-injector case to provide a variety of connected benefits, including: Separation Alerts, Auto-Injector Removal Alerts, Temperature and Expiry Alerts. When the auto-injector is removed from the Smart Case, Veta notifies and shares location information to everyone in the private Support Circle – a chosen group of trusted individuals that can provide comfort and assistance in the event of an allergic reaction. For example, a parent can be part of their child’s Support Circle and grant access to their child’s teacher or caregiver, so they can reach you physically or help coordinate support remotely.